Many herbs and spices also contain fun colors, so you can create lovely shades with items you probably already have on hand. Below is a list of possibilities. Feel free to branch out, and try any other herbs you have in your pantry. Try a tablespoon of herb/spice material, a teaspoon of vinegar (which works as a fixative to help the eggshells take color) and enough hot water to fill a pint jar. I heat the water in a tea kettle and pour it into the jars. Use caution when pouring hot water if children are nearby, and allow it to cool slightly before allowing children to work with the dyes. I put it all in wide mouth canning jars which gave room for the egg scooper to be used to life the eggs out of the dye. Let eggs soak in the dye mixture for 10 minutes or longer, even several hours, depending on desired shade (and patience). 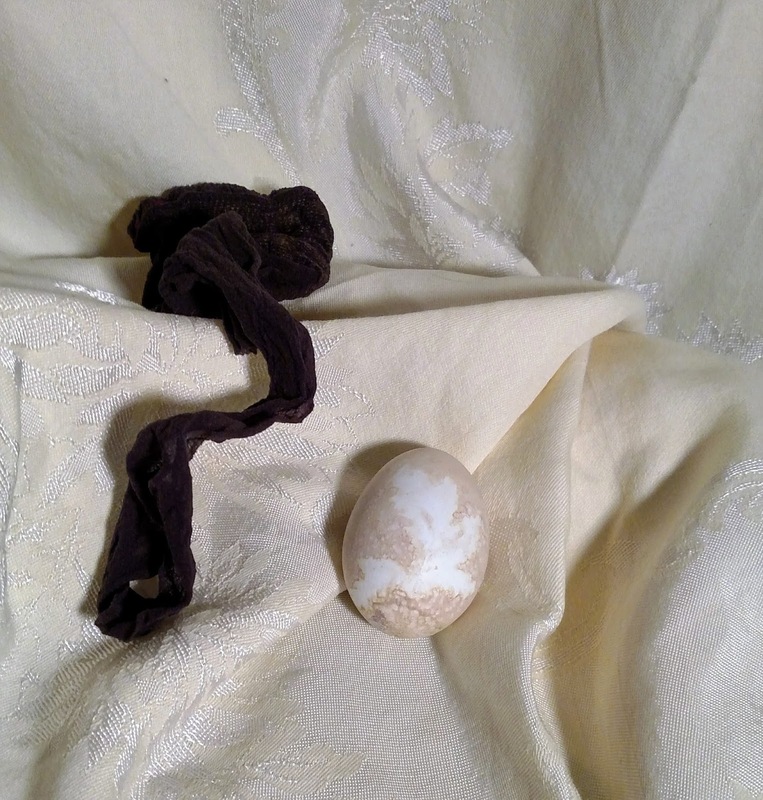 Natural dyes often give softer, earthier hues than conventional dyes. Do not leave them in overnight or the vinegar will soften the egg shell - yes I did do that! There are a variety of ways you can decorate your eggs beyond simply dyeing them solid colors. 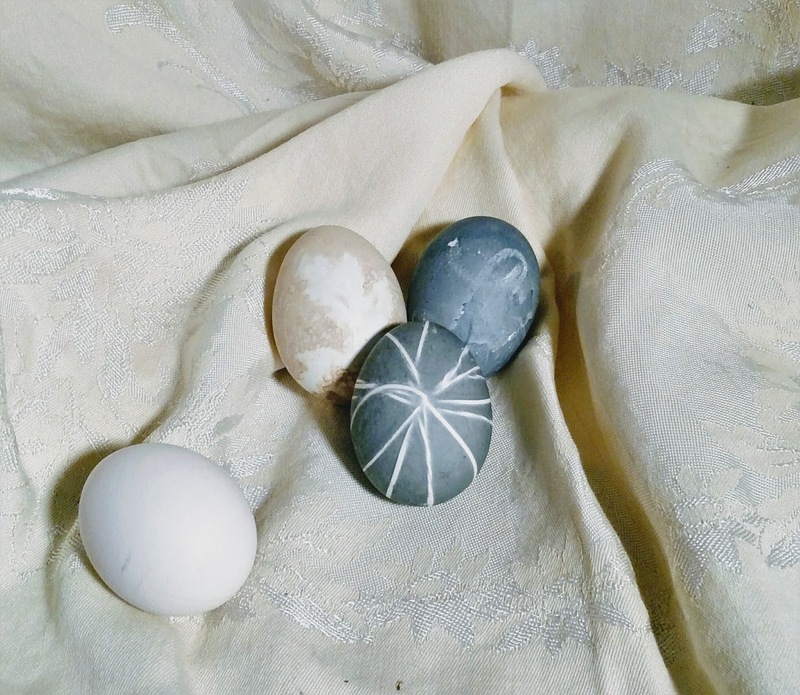 Try these ideas for adding more variation and creativity to the eggs! 1. 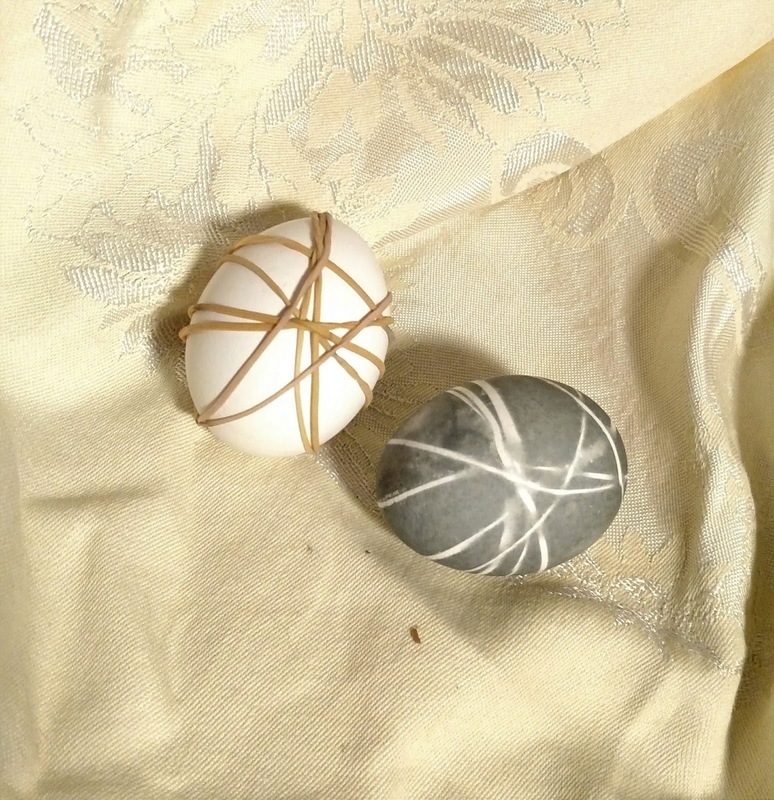 Wrap eggs in rubber bands - everywhere the band hugs the egg, there will be no dye, giving cool patterns. 4. My fave use a nylon to hold a plant leaf against the egg and when you remove the nylon the leaf pattern will be undyed. The texture of the leaf is visible in the right egg, so cool! These were dyed with rose petals giving a pinkish brown.